No, not the Metropolis everybody in comicdom thinks of with that Superman chap, I'm talking about Fritz Lang's 1927 film Metropolis. It's one of my favorite movies of all time, probably coming in a close second or third to Star Wars. 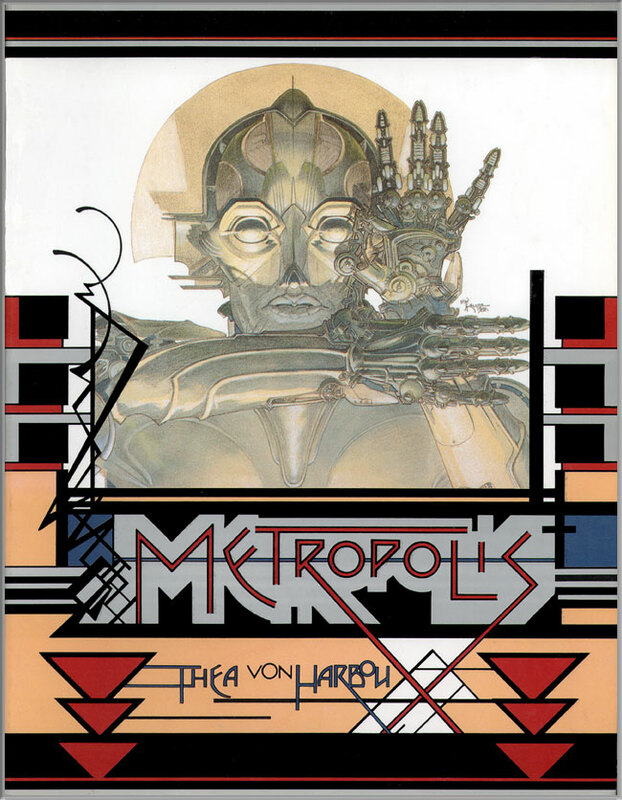 I'm in the middle of reading the original novel by Thea von Harbou; the version I've got pictured at the left with illustrations by Mike Kaluta. It, not surprisingly, goes into a lot more detail and has a few minor plot points that are omitted from the film entirely. Josaphat's escape from the Thin Man (or "Slim" as he's called here) and Fredersen's relationship with his mother, for examples. I also just re-watched the movie earlier this evening. Here's what I don't get: why is it one of my favorite movies? It's a decent enough story but the characters aren't particularly compelling. And the “The Mediator between the Head and Hands must be the Heart!” theme is fairly trite. The acting is good for a 1920's silent movie, but wildly over-acted by contemporary standards. The movie also doesn't hold a nostalgia factor for me in the way, say, Star Wars does. 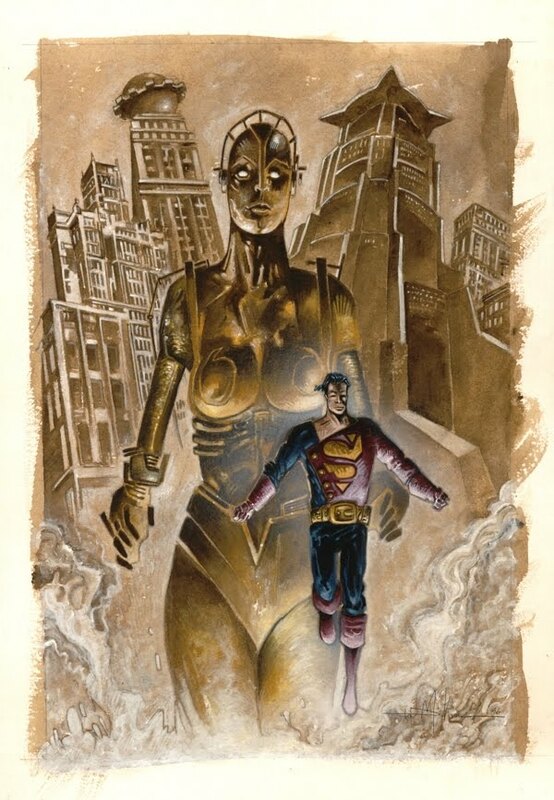 I didn't see Metropolis until about half-way through college. So what is it about the movie captivates me every time I see it? Is it just the visuals? Some of the special effects are very impressive, even by today's standards. Is the style? The expressionist movement with touches of art deco? Is it just the genre? A sci-fi movie from before sci-fi was really a genre? But I wonder if there's something a little deeper than that? Up until a year ago, I held to the belief that it was too rooted in it's time to really be relevant, but I began rethinking that when someone on another blog (can't recall where) pointed out that it's not necessarily about the industrial age and manual labor, but it can be seen in the broader context of class warfare. That undercurrent of class distinctions runs throughout the story. There are a very small number of wealthy people in control of things, a slightly largely group that interacts with them, and hundreds of thousands of peons that are effectively worthless, replaceable drones. Maybe that's what clicks for me. Maybe I've always sensed that subconsciously, even if it didn't register at a higher level. I bring it up here because it's something worth thinking about. Not necessarily the relevant themes of a nearly century old movie, but the notion of examining your own interests in media consumption. Why do you read the comics you do? More important, why do you like the comics that are your favorites? I suspect many people haven't really thought about it that deeply before, and I wonder if it's maybe time you start. 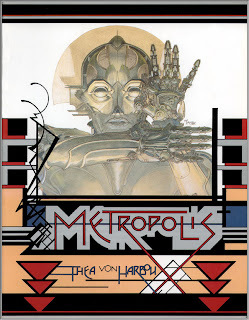 1) I had no idea there was a novel behind Metropolis. 3) You've seen the anime film it inspired (or read the manga behind it)? Thoughts? Just out of curiosity. 1) My understanding is that Lang and his wife were inspired to come up with the story on a trip to NYC. She wrote it as a novel, in part, to help sell the idea to producers back in Germany. 2) Also impresses me with the scenes that are a mix of live action and stop motion. And the transformation scene where the Machine-Man takes Maria's appearance. I keep thinking, "This was 1927?!?" 3) Saw the anime back when it came out. It was well done, I suppose, but it didn't really do anything for me. I don't recall particularly liking any of the characters.